The semester’s over; grades are posted; and the verdict’s in on Tim Vetscher’s JRN212 broadcast writing class at Paradise Valley Community College. I rate the class five stars for lessons learned in broadcast writing, video production and Final Cut Pro usage. Vetscher also brought in folks from all parts of the industry to talk to us, and he rewarded us with a tour of ABC15 studios and a chance to see the 6 p.m. newscast live. Tim Vetscher prepares to teach PVCC students JRN212. Sallie Christopher uses numbers to buy a reliable car, but she also teaches students at Paradise Valley Community College the value of numbers and how they play a part in their lives. 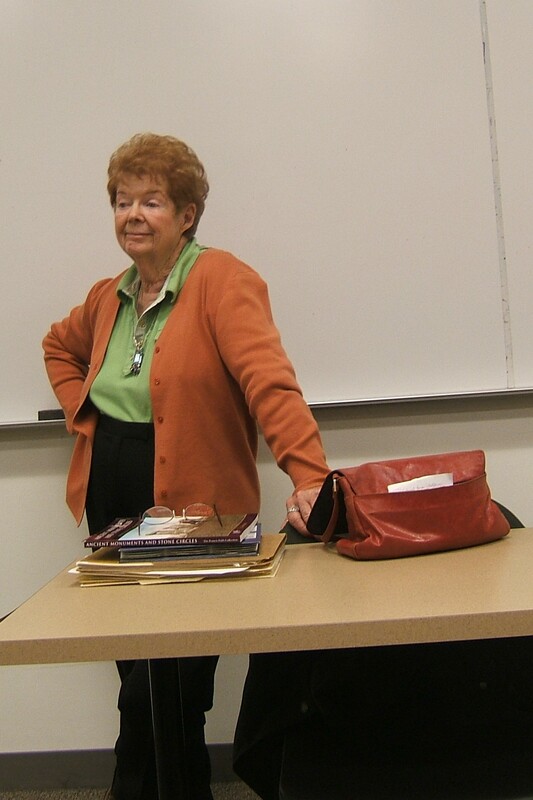 Sallie Christopher answers questions during her class at Paradise Valley Community College. Christopher teaches a numerology class, which she keeps lively and intimate. Students receive a number of handouts during class. The handouts contain the history of numerology and a bibliography of numerology books that Christopher uses and recommends. She supplies worksheets to compute such things as student’s personal year, universal year and life path and charts to explain numerological findings. Whenever a student experiences problems with calculations or asks questions, she makes sure that they understand everything before moving on. She also discusses questions before and after class. Christopher really uses numerology to purchase a reliable vehicle. Her class learns the method to calculate the number for this decision by using the numbers contained in the vehicle identification number. Vehicles with two contain electrical problems, and vehicles with seven require frequent repairs. In one instance, the manager at a dealership approached Christopher and said he heard she used the VIN to purchase the vehicle. She told him she used numerology to make her decision. The manager asked her for the calculation because he owned a problem ridden vehicle. The next day when Christopher returned to the dealership, the manager told her he put his car on the market because the vehicle was a seven. I completed her numerology class and learned a lot about myself and how to improve my life using numerology. Christopher teaches other noncredit courses at PVCC with her next class, I Ching, scheduled for April 27. Student Miguel Saucedo, ABC15 multimedia journalist Tim Vetscher and TV producer Jorge Melchor work on broadcast pilot. Every Friday morning, the Paradise Valley Community College Puma Press newsroom comes alive with bright-eyed students anxious to learn the latest techniques in the broadcast world. Puma Press adviser Judy Galbraith recruits the best and brightest personalities to come in and teach students all of the aspects of journalism. Jorge Melchor and Judy Galbraith, Puma Press adviser and journalism instructor, discuss broadcast projects. 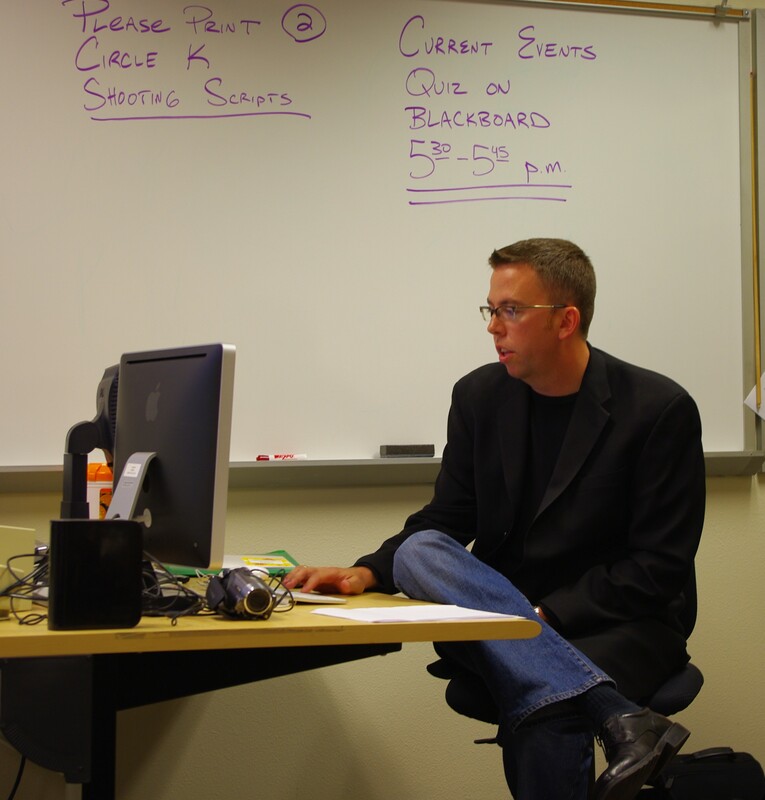 In the spring and fall 2009 semesters, Puma Press editors got the opportunity to work with ABC15 News multimedia journalist Tim Vetscher on a broadcast pilot. Miguel Saucedo and Tim Vetscher brainstorm a video script. Vetscher took students through all of the steps of producing a video for broadcast including gathering information, logging clips, writing the script, completing the personal audio, editing the information and publishing the final product. He explained the shots needed for B-roll, which covers all of the video clips from interviews to background information, and A-roll for all the audio information. The B-roll consists of wide, medium and tight shots. The interview process uses the rule of thirds, and students need to be aware of shooting subjects from the right and the left to maintain balance in their production. Miguel pre="Miguel ">Saucedo and Tim Vetscher edit Saucedo's video. The rule of thumb is five seconds for B-roll clips, says Vetscher. Think in a sense of sequencing while shooting B-roll using a wide shot, a medium shot and then a tight shot and don’t do anything the eye can’t do. Writing scripts using the inverted pyramid, students plan their shots, so they know what they need to film. Vetscher says that it’s important to use the inverted pyramid style to start vague and work down to very specific details thus capturing and keeping the viewers’ attention. Students cover a wide range of subjects including David Bradley’s Musiciphilia, the Dignity Memorial Vietnam Wall, women in the military, the PVCC enrollment and budget, H1N1 flu strain and many other topics. Students also gained other valuable help from Jorge Melchor, a TV producer from Mexico, who recently joined the program and shared his expertise. Student Carmela Kelly, Miguel Saucedo, Tim Vetscher and Jorge Melchor work on broadcast projects. The pilot covers the use of the camera, Final Cut Pro and lots of hands-on and group practice and interaction. Students go out and shoot their clips and work to produce videos that get posted on the Puma Press Web site. In spring 2010, Vetscher teaches a broadcast class JRN 212 for credit. He’ll use the textbook “Television Field Production and Reporting” to teach students even more about the subject of multimedia journalism. Paradise ValleyCommunity College offers a wide range of noncredit courses in addition to its credit courses. I’ve taken many of their courses over the years online and at their campus. They not only teach you the subject matter, but they give students an opportunity to meet new and interesting people. My latest venture includes a Beginning Conversational Spanish course. I took Spanish for three semesters at ASU in the mid-1980s, but the instructors never made us speak enough Spanish so that we’d feel comfortable speaking to Spanish speaking individuals. I think that when you’re older and learn a language there’s a tendency to be afraid of making mistakes and that kept me from speaking Spanish. Now I go to cover stories for The Catholic Sun and many of the people speak Spanish. I loose a lot from the story when I can’t interview these people, so I decided to do something about it. Every Tuesday night for eight weeks from 6 to 8 p.m., I attend my Beginning Conversational Spanish class. We get to know each other and our instructor, Albert Shank, makes sure that we speak Spanish during class. He teaches us basic phases and adds vocabulary, and he also asks us for phrases we need to know in our daily lives or for future ventures. The first night of class we worked in groups of two or three and prepared a conversation to give in front of the class. We worked on it during class and each group gave their presentation at the end of class. Even though I hate to get up in front of people and speak, I survived and remembered most of the conversation. The Spanish text used in noncredit conversational Spanish class. We work from our text book, “E-Z Spanish,” in groups to learn new vocabulary and phrases. We watch Spanish videos and Shank asks questions about them. Shank suggests that we use English to Spanish flash cards to learn five to seven words a day. A half hour per week of Spanish news, game shows and soap operas also helps in the learning process, he says. Learn five to seven new Spanish words per day with flash cards. In addition, Shank gives us links to free online study guides like WordReference.com and StudySpanish.com to help us learn Spanish. StudySpanish.com provides tutorials with audio and visual features. I also like to go to FreeRice.com and change the subject to Spanish. I not only learn the meanings of Spanish words, but I also get to contribute rice to hungry people. Shank encourages us to go to Ranch Markets and strike up a conversation with Spanish speaking people there. Even though I won’t be fluent in Spanish at the end of the course, I think this noncredit course gives students an affordable way to learn conversational Spanish. The Northwest Regional Library, a part of the Maricopa County Library District, offers two free classes on genealogy each month. During these classes, Susan Smith shares over 24 years of experience and information that she continues to accumulate while searching for her family roots. Smith distributes free handouts in both classes and gives a list of useful magazines, books and Web sites to help gather information. Participants in the class follow along with the handouts and the computer presentation on the big screen in front of the classroom. They ask specific questions about their own family members, and Smith quickly shows them how to search for their existence using different Web sites. The library maintains three databases that patrons may use to do research: America’s Obituaries and Death Notices, Heritage Quest Online and Ancestry Library. Ancestry Library must be accessed at the library, but the other two research sites may be accessed by logging onto the library Web site from any location. Smith hands out a lavender library information sheet, which contains information on these databases. She also distributes a green handout that gives instructions on Ancestry Library. Students learn research tricks that only a seasoned genealogy researcher knows. The beginners’ class runs from 1 to 2:30 p.m. while the Internet class last at least two hours from 1 to 3 p.m. and sometimes later. In the beginners’ class, Smith supplies students with information and forms on how to begin their research. She answers students’ questions and suggests possibilities to make their research easier. In the Internet class, students receive pages of Internet Web sites to do research locally, nationally and internationally. One site reviews genealogy software, another gives access to the full text of books and others show how to publish family trees online. Also included are links to blogs, podcasts, videos, cemeteries, prison and insane asylum records and newspapers. Smith throws in a bonus by listing the largest genealogy library in the world, the Family History Library. This Web site contains instructions to download free software and the library’s whole catalog.